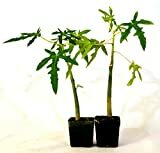 Papaya tree growing herb of the genus Carica also known as Papaya or Carica papaya, Papaya tree perennial evergreen plant used for the edible fruits and also used as ornamental plant, grow in tropic, mediterranean or subtropical climate and growing in hardiness zone 9+. Leaves grow on stem 0.4-1.2 length, the leaves lobate in the edge size 20-90 cm. Flower color yellow, flowers can separate on different plant to female and male flowers on or can grow the same tree hermaphrodite. Fruit color yellow or orange and sometime part of the fruit can be green, shape can be round or oval the size 3-50 cm. 50+ Very Fresh! Strawberry Papaya! 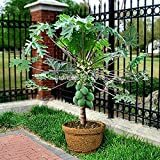 tropical fruit tree seeds plant VERY EASY! 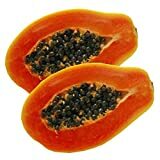 What can be done with big quantities of Papaya tree fruits?